It would seem that Jay had discovered his passion of photography upon inheriting his father’s hand-me-down film Nikon camera, at the young age of fourteen. Jay immediately developed an affinity to looking at life through the lens of his camera and what ensued was an exciting photographic journey that would eventually lead him to his career as professional photographer. Though beginning under the tutelage of his father, former National Geographic photographer, Kevin Fleming, Jay naturally developed a photographic style and identity all his own. Through experimentation, an incredible amount of patience & preparation, and countless hours spent researching potential photo opportunities, Jay began to capture such awe-inspiring photographs on his own. A pair of Yellowstone Cutthroat trout underwater, the last house on Holland Island reflecting in the rippling water just before it collapsed, and a fleet of wooden Skipjacks against an ominous grey sky are among Jay’s earliest works that reflect his current style. Jay considers himself to be extremely fortunate to have found a livelihood that both satisfies his creativity and simultaneously supports his beliefs in environmental conservation. Jay spent the summers of 2011 and 2012 working in Yellowstone National Park to preserve the park’s dwindling population of native Cutthroat trout. During this time, he was able to explore his surroundings and capture some of the iconic beauty of the park’s landscape and wildlife—however, what was most memorable to him was the fact that some of those very photographs directly contributed to raising awareness to the conservation efforts being made. Jay’s photographs of these threatened Cutthroat Trout appeared in a National Geographic publication that informed the public of the increasing threat of invasive species. Closer to his home in Annapolis, Maryland; Jay has turned his attention towards the Chesapeake Bay. Jay spent three years documenting all aspects of the Bay’s rapidly changing seafood industry for his first book, Working the Water, released in the fall of 2016. From underwater photographs of Blue Crabs swimming in lush beds of underwater grasses to incredibly poignant portraits of laborers working in a oyster shucking house, to portraits of watermen in their deadrise boats leaving the dock before sunrise, Jay illustrated the full spectrum of the Chesapeake Bay’s fisheries in Working the Water. This title is currently in its third and final printing. Jay’s documentation of the iconic seafood industry proved to be an incredibly powerful educational tool in raising awareness for the people and the processes involved with bringing commonly commonly consumed seafood products to market. In the fall of 2017, amidst other photography and video projects, Jay committed to his second book, Island Life. Jay after 10 years of making trips to Smith and Tangier Islands - the two only inhabited offshore islands in the Chesapeake Bay - Jay developed an affinity for the environment and the island communities. Island Life will explore the environment and the seasonal Chesapeake harvests that provide the rhythm for community life, while documenting the tenacity and determination of the Smith and Tangier islanders who honor their traditions while facing an uncertain future. Island Life is expected to be released in October of 2021. Whether it’s a dramatic sunrise over the water or a fishermen hauling gear, the passion for his craft and for visual storytelling is obvious in every photograph. Jay’s talent is undeniable, his is photography is not only beautiful but purposeful. 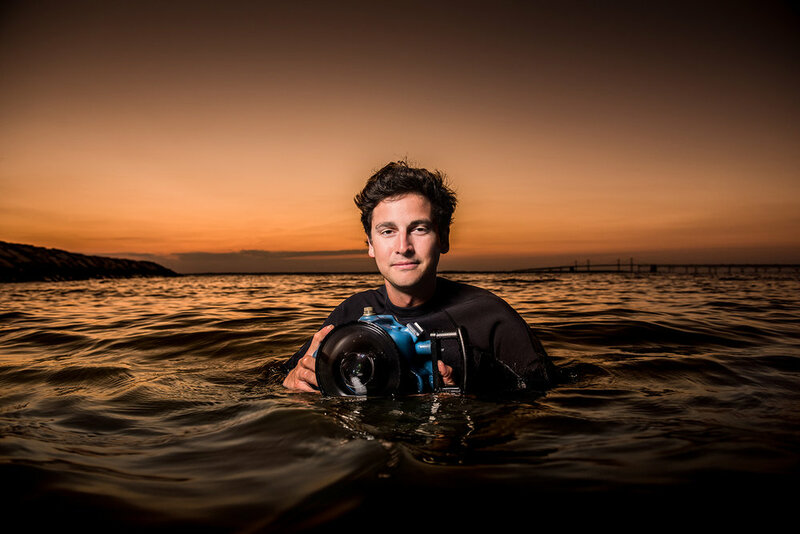 Jay discovered his passion of photography upon inheriting his father, former National Geographic photographer, Kevin Fleming’s hand-me-down Nikon film camera at the age of 13. Jay immediately developed an affinity to looking at life through the lens of his camera and what ensued was an exciting photographic journey that would eventually lead him to his career as a professional photographer. At the age of 31, Jay has an extensive portfolio that is sure to impress. Jay’s first book, Working the Water - a photographic narrative of the Chesapeake Bay seafood industry, is in its third printing and his second book, Island Life, is expected to be released in the fall of 2021.